With the rapid progress in micro-fabrication techniques, development of miniature devices for bio-chemical analyses is becoming a major topic in research fields such as chemical engineering, and bio engineering. These devices are integrated into small on-chip systems, which are called micro-TAS (micro-total-analysis-system) or Lab-on-a-chip. Realization of Lab-on-a-chips lead to reduction of sample volume and processing time, increase in efficiency, and manpower saving. In most kinds of bio-chemical analyses, handling of sample solutions and temperature control are very important issues. These aspects are even more important in micro-scale devices, where fluid motion is known to show different behavior compared to flow in large-scale devices. Therefore, proposing micro-scale biofluidic devices designed from the viewpoint of thermo-fluid dynamics will provide new insights to the micro-TAS field. We have developed a novel adhesion-based continuous cell sorting system that requires no labeling process prior to separation. 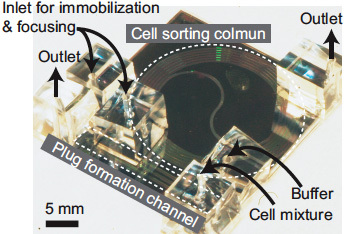 Lateral cell separation of HUVEC (Human Umbilical Vein Endothelial Cells) has been demonstrated in a cell sorter prototype. In addition, we propose a new label-free continuous sorting method based on specific adhesion between target cells and antibody immobilized on oblique grooves of the channel wall. By optimizing the groove dimensions, lateral cell displacement twice as large as our earlier report has been obtained. Continuous lateral separation of HeLa cancer cells from mouse whole blood has been demonstrated. 26th IEEE Int. Conf. Micro Electro Mechanical Systems (MEMS’13), Taipei, (2013), pp. 141-144. "Label-free Adhesion-based Cell Sorter Using Optimized Oblique Grooves for Early Cancer Detection,"
24th IEEE Int. Conf. Micro Electro Mechanical Systems (MEMS'11), Cancun, pp. 904-907 (2011). "Label-free Continuous Micro Cell Sorter with Antibody-immobilized Oblique Grooves,"
22nd IEEE Int. Conf. Micro Electro Mechanical Systems (MEMS2009), Sorrento, pp. 60-63 (2009). "Label-free Continuous Cell Sorter with Specifically Adhesive Oblique Micro-grooves,"
J. Micromech. Microeng., Vol. 19, No. 12, 125002, 10pp (2009). "Adhesion-Based Cell Sorter With Antibody-Coated Amino-Functionalized-Parylene Surface,"
J. Microelectromech. Syst., Vol. 17, No. 3, pp. 611-622 (2008). "Adhesion-based Cell Sorter with Antibody-Immobilized Amino-parylene,"
20th IEEE Int. Conf. Micro Electro Mechanical Systems (MEMS 2007), Kobe, pp. 27-30 (2007). Angele, K. P., Suzuki, Y., Miwa, J., and Kasagi, N., "Development of High-Speed Micro Scanning PIV Using a Rotating Disk," Meas. Sci. Tech, Vol. 17, No. 7, pp. 1639-1646 (2006). Chaktranond, C., Fukagata, K., and Kasagi, N., "Performance assessment and improvement of a split-and-recombine micromixer for immunomagnetic cell sorting," J. Fluid Sci. Technol., Vol. 3, pp. 1008-1019 (2008). Inokuchi, H., Nagae, K., Suzuki, Y., Kasagi, N., and Shikazono, N., "Evaluation of Lamination Micro Mixer for Micro Immunomagnetic Cell Sorter," Int. Conf. Microtechnologies in Medicine and Biology, Okinawa, pp. 131-134 (2006). Inokuchi, H., Suzuki, Y., and Kasagi, N., "Micro Magnetic Cell Sorting System with a Function of Continuous Labeling and Separation," 13th Int. Conf. Miniaturized Systems for Chemistry and Life Sciences (MicroTAS 2009) , Jeju, pp. 1877-1879 (2009). Inokuchi, H., Suzuki, Y., Kasagi, N., Shikazono, N., Furukawa, K., and Ushida, T., "Micro Magnetic Separator for Stem Cell Sorting System," 22nd Sensor Symp., Tokyo, pp. 125-128 (2005).